"Mission Impos-slug-ble" / "Something Old, Something New, Something Bob Catered For You"
The Belchers always stick together. Even though each family member has their turn being irrational, overly ambitious, and putting everyone in their lives in a dangerous situation, they will always get the support of the rest of their family. In the case of the final two episodes of the season, that means standing by their own even when they don’t follow the rules or go a little overboard comparing their work as a caterer to that of a doctor without borders. In “Mission Impos-slug-ble” it’s Louise who needs the help of her siblings after getting caught trading banned game cards during a study session (think Pokemon, but everyone is a slug). Tina and Gene spend the day trying to talk Louise out of making the deal in an area where she could risk getting caught. 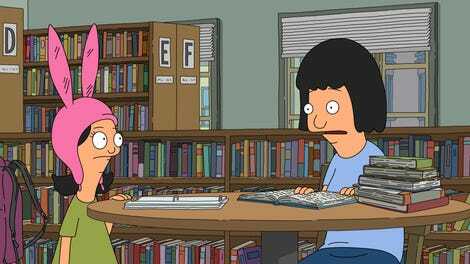 The need for a voice of reason paired with Tina and Louise’s relationship as mentee and mentor for a new study group leads to the introduction of Tina’s greatest alter ego yet: Mathy Kathy. She’s been around the block, teaches math with the speak of a 1920s gangster, and does not wear glasses. Despite the stern warnings of Mathy Kathy, Louise ends up in trouble, in part because of Gene and Tina leading a group of teachers right to her. It’s an ire between Louise and her siblings that has not been shown before. But at the end of the day, Regular-sized Rudy is not the best partner-in-crime (partially because Louise’s schemes are actually killing him) and the Belchers are able to compromise, finishing out Louise’s plan while still remaining good people. At the same time Bob is coming to terms with a long feud he had with Harry the pickle guy and realizing he could have been a better man in the situation while becoming uncharacteristically emotional. And Bob’s emotions don’t stop there. Linda and the kids come together to help Bob find meaning in his life in the true finale, “Something Old, Something New, Something Bob Caters For You.” Feeling less than because he is slinging burgers while there are doctors traveling the world to cure diseases, Bob clings to the success of a couple who met in his restaurant. It’s turns the tables on the relationship between Bob and Linda—for once Bob is the sentimental and romantic one while Linda is skeptical of this couple’s love for each other, which she makes perfectly clear through a series of hilarious off-handed comments at the couple’s wedding. But when things start to really fall apart, she steps up to help not only Bob, but Carlton (er, Connor) and Farrah just as they begin to question their love. It’s because of her love for Bob that she can save this marriage and Bob’s reputation. Once again, Bob’s Burgers goes out with a big, musical bang. Especially in stories like “Something Old” when emotions are running high, it makes things so much more dynamic when a well-crafted, Broadway-esque number is brought into the episode. 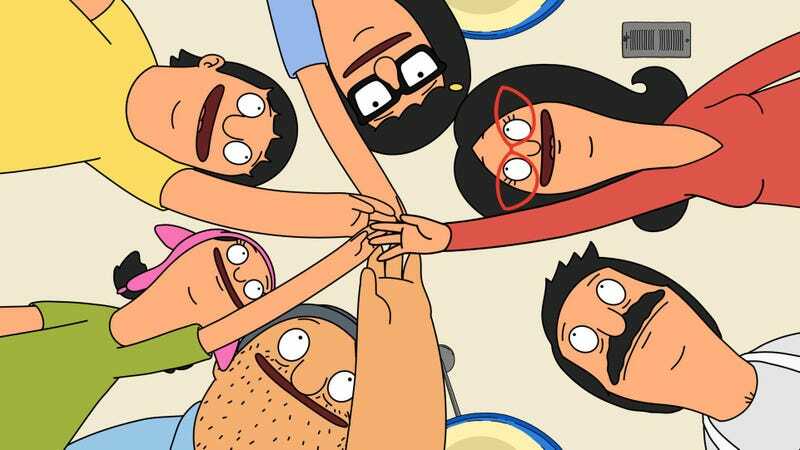 The musical team of Bob’s Burgers is one of the most talented groups in entertainment today, and they helped send-off season eight with the gusto, drama, and heart it deserves. Between the shishito burger and the “I’m Too Old for This Schvitz” elderly sauna company, I wonder if the writers are starting to get tired of thinking up these puns every week? One-liner MVP of season eight: Gene, without question.